You Probably Looking for an Answer that What is Difference Between Arduino and Raspberry Pi So Here is an Answer !!! Many leading projects require the use of development boards, they are the backbone of modern electronics. Which board needs to be used and where is what you need to be aware of. Two of the boards which I'm going to discuss today are "Arduino" and "Raspberry Pi", What is difference between Arduino and Raspberry Pi and which are the most popular boards among students. Beginners find it hard to distinguish between which boards to use? and why is one board preferred over the other in certain situations? This article will help you to decide between the two. Arduino is a microcontroller motherboard which provides a platform for building hardware and software systems and it is considered as one component in a computer. *Making a robot for home security. Arduino does not function on an operating system. Arduino is a very simple motherboard. It cannot be connected to any external devices and contains only small amount of storage memory. It does not have any keyboard or mouse input or a video output.The Between Arduino and Raspberry Pi is explained in details in this topic yet not finished, The solution continues to chose one over other below. Raspberry pi is commonly known as a general purpose full-fledged computer and can perform tasks like your desktop Pc. You can push your limits in coding and circuit making using Raspberry pi. *Designing a robot which performs multiple tasks. Unlike Arduino Raspberry Pi runs on an Operating System called the "Linux" Operating System which is specifically designed for it and is known as the Rasbian. However other Operating Systems like Windows 10 or Android can also be installed on Raspberry Pi. In Raspberry Pi you can interact with your program using external devices such as a keyboard and mouse, and you can also plug in a display. You can easily get access to input/output pins and can connect all types of devices including buzzers or whatever you may require. 1) It is very simple to interface electronics equipment and the coding itself is much simpler than raspberry. Without the need for networking. 2) It operates on a wide range of voltages and it requires less power. 3) Arduino can be easily turned ON or OFF without any risk of damage. 5) Simple projects such as building a home automation system are much easier with Arduino where you do not to get to complex. 6) There is no Linux and software hectic. 1) It is more complex and can carry out intense tasks like building a complex robot or turning on and off hundreds of lights in equal intervals, or if you're making a web server then Raspberry Pi is necessary. 2) Networking is provided via the Ethernet port present in the chip. So you can access internet, Bluetooth or Wi-Fi. 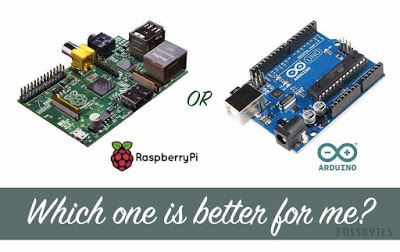 3) Raspberry Pi is 40 times faster than Arduino. 4) You don’t have to waste your time going through programming languages, all you need is basic electronics knowledge.